Can you even imagine a computer that costs $150,000? 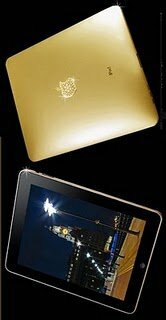 Such is the case of this iPad that can be customized with shades of gold and assorted gems. It reminds me of how we can be so fixated on having the latest and the greatest cell phone, laptop, gigantic flat screen television or video gaming system. I wonder what it is about these adult toys that bring out the crazy in us?